The State Museum of Theater, Music and Cinema of Ukraine is the only museum of this kind in the country. The museum's collections feature unique exhibits of theater, music and cinema history. The collections were started in 1923 and became a basis for the scientific research and the documentation of cultural history of Ukraine. The museum is also a famous place where creative meetings, scientific conferences, presentations are usually held. This is a place where lectures on history of Ukrainian theater and cinema are delivered. The State Museum of Theater, Music and Cinema of Ukraine was founded in 1923 by the artistic union «Berezil» headed by the prominent figure of Ukrainian theater Les' Kurbas. First it was a small theater museum. The special museum commission consisting of famous actors and theatrical figures of that time was charged with the duty of creating and arranging the museum. From the first days of its foundation the museum supposed to represent theatrical activities of the whole Ukraine. The members of the commission tried their best to gather everything important concerned with dramatic art in Ukraine. In 1923 the artistic union Berezil organized the first exhibition that consisted of the first gathered collections: sketches of the theatrical costumes, most interesting photos and posters. Two years later on behalf of Kiev city administration museum got its first headquarters — three rooms in the foyer of the Lenin Theater, former Solovtsov Theater. The first excursions were put in practice. In 1926 when Berezil as the best theater of Ukraine moved to Kharkov (the capital of Soviet Ukraine by that time) the gathered collections were transmitted under the aegis of All-Ukrainian Science Academy to its department of history and philology. The Theater Museum of Ukraine organized there became the separate and independent organization. The collections of the new museum were presented to the public in October, 1927. The exposition gave the clear conception of Ukrainian theater, its history and development. The effort to trace the development of stage process through the system of exhibition images was conducted for the first time. The first exposition was arranged in three halls. In the first hall the period of Ukrainian theater history before October revolution was represented. The period was divided into four parts: school theater, preliminary theater, national theater, common and revolutionary theater. Programs, posters and photo documentaries illustrated the theatrical activity. The rich collections of museum also gave good opportunities for outdoor exhibition activities, organized thematically. The number of mobile exhibitions was arranged. 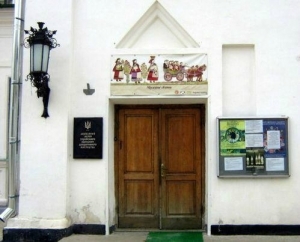 These exhibitions included Ways of Ukrainian Theater, History of Berezil Theater, Ukrainian Puppet Theater, Ukrainian Theater in Five-year Plan. The exhibitions traveled to various cities of the USSR and also to Paris, Prague, Warsaw and Riga. The same time the library of the theatrical museum was formed, and the museum itself gained a status of the State Museum of Theater of the Ukrainian Soviet Socialist Republic.